This past week, I was moved by the memorial for the late Chancellor Chang-Lin Tien. The first Asian American to head a major research university, University of California Berkeley, which he led from 1990 to 1997, he was remembered again on the tenth anniversary of the naming of an East Asian Library in his honor. His improbable career continues to offer guidance. An immigrant from China via Taiwan, he was trained as a mechanical engineer, and would not have been regarded as a typical candidate for such a high level leadership role. What was most remarkable about Chancellor Tien is how he championed diversity — as complementing, not conflicting with, excellence. He served when California voters passed Proposition 209 banning the consideration of race in college admissions, and California politicians began their severe budget cutting for the best public system of higher education in the nation. Contrary to expectations that might have been unconscious prejudice, Chancellor Tien turned out to be a terrific fundraiser. He also embraced the athletics program so enthusiastically that rumors, probably unfounded, circulated that he personally put on the mascot suit to cheer at games. “Go Bears” was the motivating phrase in both the fundraising and the athletics. Personal experience explained Chancellor Tien’s motivation, as an Asian immigrant, for supporting civil rights. When he arrived in the Deep South two years after the Brown v. Board of Education decision, as “massive resistance” to racial desegregation was open and unabashed, he was shocked by buses having a White section and a Black section. He was confused about where to sit. Although he was told it was okay for him to join the Whites at the front, he was so uncomfortable about that invitation that he walked and then bought himself a bicycle to get around. I heard him relate that anecdote in speeches with such heartfelt sentiment decades later there could be no doubt about the impression racism had made on him even if he had escaped the worst of its direct effects. The reason Chancellor Tien was effective in delivering a message about diversity was his own high standards. In his scholarship and teaching, he was exemplary. That is not common, to be both a renowned researcher in a specialized field as well as an award winning instructor. His life also showed his integrity. So it was apparent that advocating for inclusion did not mean apologizing for lack of merit. His whole career was at the University of California (two years at the Irvine campus), which meant he was not an ambitious administrator looking for a stepping stone. When he left the chancellorship, he resumed his professorship. It would make such a difference in the public dialogue about affirmative action if Chancellor Tien were still around. He would prove to Asian Americans especially how bridge building with other people of color was needed. Among the speakers at the library ceremony was the current Chancellor, Dr. Carol Christ. The first woman in the office, she was mentored by Chancellor Tien. That too is a demonstration of true commitment. Not everyone who claims to welcome people of all backgrounds does that on their own team. The University of California shows the two stories of public higher education. Perhaps Chancellor Tien’s narrative emphasizes the better half of human nature. The positive story is about access and opportunity. The “master plan” in the Golden State, developed during a time of prosperity and optimism, made a promised terms that were more explicit than implicit. Taxpayers would subsidize a comprehensive set of institutions, students would be charged low tuition (indeed, state residents were billed only for “fees”; out-of-state matriculants paid “tuition”). Higher education was a public benefit. Everyone would be better off if people acquired skills. The negative story is about exclusion and divestment. Year over year, regardless of which political party has had control, the state has decreased the amount it appropriates for higher education. Even when it looks as if money has been put back into the project, it is an illusion, because costs such as pension contributions simultaneously are shifted to the campuses. Higher education has become a private benefit. People pursue it for their individual self-interest, not only in their own minds but in others’ perceptions. I was merely acquainted with Chancellor Tien. He was the generation of my elders. Yet he continues to inspire me. It is good to be reminded of the possibility of leadership that is genuine in care for a community. 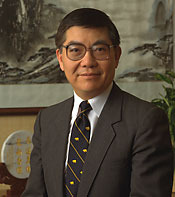 Frank H. Wu is William L. Prosser Distinguished Professor at University of California Hastings College of the Law.